With temperatures set to freeze and the joys of last year’s heatwave a distant memory, it’s the perfect time to look for an excuse to escape the cold. Our selection of winter golf destinations offers the chance to exchange grey days for blue skies whilst practising your game! Explore our favourite places to golf between November and March. Set within extensive gardens, this resort offers 6 swimming pools and two 18-hole golf courses. Nestled next to Atalaya Isdabe Beach, the sparkling sand and glistening sea are right on your doorstep. Located on southern Spain’s sunny Costa del Sol, Malaga boasts a rich and vibrant culture. Steeped in history, the city blends the old with the new. From superb museums and golf courses to bustling bars and restaurants, there are a wealth of things to do while making most of the year-round sunshine. Set within 360 acres of natural beauty, the Penina golf resort is the original home of golf in the Algarve. The five star hotel leads the way in high-class service and Portuguese charm, and ensures relaxing family holidays and corporate retreats. A Faro winter golf break guarantees plenty of sunshine, superb food and a truly relaxing getaway. Located in the Algarve, the ‘golfing gem’ of Portugal, this is a prime location to play golf against a beautiful coastal backdrop. This contemporary style, luxury hotel is ideal for golf enthusiasts. Located just a few steps from and overlooking the world-renowned, 27-hole golf course of Vila Sol the resort is also in close proximity to several other courses. Portugal is the perfect spot for a winter golf trip, the weather is still warm, but not scorching, it’s lively but it doesn’t attract the waves of crowds that the summer months and because of this the courses will be cheaper! Set in a picturesque valley, this property boasts a 27-hole golf course. Relax around the outdoor pools and take in the views of the Sierra Blanca Mountains. Ideal for families, the resort offers a kid’s club ensuring you have peace of mind that everyone is entertained. A winter golf trip to Spain is a no brainer. Although Spain boasts beautiful warm temperatures all year round, this Mediterranean country is one of the best places to play golf in November as it offers sunshine basked golf courses, delicious seasonal food and a relaxed atmosphere to make you feel like you’re truly escaping. This beautiful complex in Tenerife is set between Playa de Las Americas and Los Cristianos, with the beach just over a mile away. The resort offers luxurious accommodation set in an array of tropical gardens with fountains and terraces. The young golf course is a masterpiece and the undulating and elevated greens are designed to challenge every player. A winter golf trip to the volcanic landscape of Tenerife offers reasonably priced activities, budget flights and a chance to feel like you’re truly getting a summer feeling in the dreariest months. At this beautiful destination luxury is always the standard, golf is never considered just a game and together the two allow you to immerse yourself in an enviable winter sun lifestyle. Embrace all that Florida has to offer and enjoy five championship golf courses and spend the evenings relaxing around the resort and spa. Even though January is the coolest month of the year in Florida, but this is all the more reason to consider it for a winter golf trip. Head far away and enjoy average temperatures of 23 C, enjoy the outdoors during the day and the atmosphere during the night. This award winning golf and spa resort offers modern villas with private swimming pools and sun terraces, spa facilities, a fitness centre and a tennis court. The All Year Round golf course at Aphrodite Hills is a magnificent 18-hole championship course, that overlooks the site where the goddess of love is said to have emerged from the sea. There is no doubt that Paphos is one of Europe’s best destinations to head to play golf in January, as Cyprus as one of the warmest winters in the Mediterranean. It is a truly year round location, so enjoy timeless villages and stunning coast lines between your golf games. Guests at Gloria Golf will find themselves surrounded by beauty and luxury. The hotel offers a huge variety of restaurants, spa and fitness facilities and is only a stone’s throw away from the beautiful local beach. The course is set in gently undulating tree lined fairways and is truly a natural challenge for golfers of all levels. Turkey can be one of the best spots to enjoy a taste of winter sun, there will be serious discounts, days will be cold but sunny and the atmosphere is guaranteed to be as good as ever. 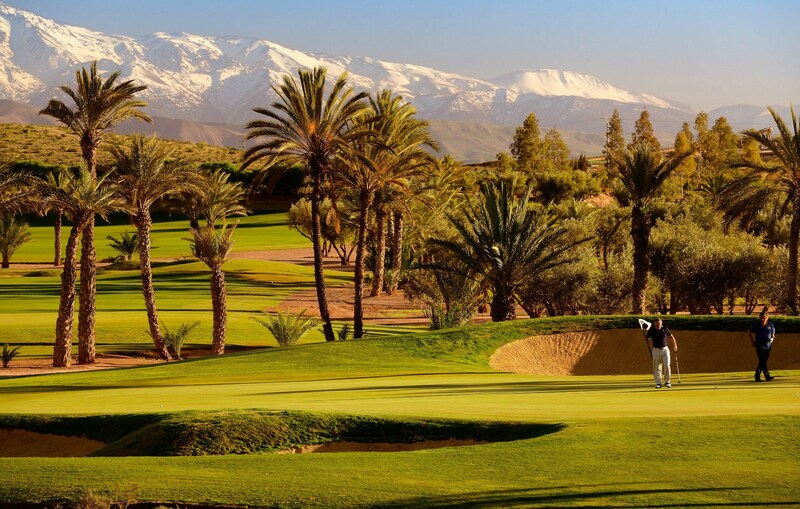 Just a short 3km from the Old Town of Marrakech, Riu Tikida Garden is a beautiful resort and golf course. The magnificent 4 star hotel offers guests quality service and luxury surroundings, while the course is the oldest and most regal in Marrakech and is set in the dense forest overlooked by the Atlas Mountains. Marrakech is the perfect destination for a bit of winter sun, you will get the feeling that you are in a far away land, without the need to endure a long flight. Golf courses will have more availability and crowds won’t be as full one, yet you’ll still get the same food, fun and sun. The Heritage Awali offers some of Mauritius’ most elegant rooms surrounded by beautiful gardens, pools and beaches. The golf course stretches out across 100 hectares between mountains and the sea and is one of the most beautiful on the island. Guests can also relax in the Seven Colours Spa or enjoy some winter sun on one of the many terraces. The warm season in Mauritius generally lasts from December to April with average daily high temperatures of 29 C. If you want a truly exotic and magical winter golf trip, the tiny island in the Indian Ocean should be on your list! Why book a winter golf trip? Heading away during the winter is a great way to guarantee that your resort of choice won’t be overrun with holiday makers. Families and big groups will tend to stick to school breaks for their trips, but a winter golf holiday allows you to avoid big parties or noisy hotels.This means you can enjoy your pick of the sun loungers, no queue at the bar and no back up on the golf course. As we have seen, the winter months might be less popular for getting away, however many resorts and airlines will offer deals and discounts for anyone willing to venture out at this time of year. Golf courses will often have more availability and lower prices during this time of year, so a winter golf trip could be a great way to holiday without spending a fortune. It is widely known that the months between December and April can be some of the dreariest of the year, therefore topping up on some sunshine can do wonders for your health and wellbeing. Vitamin D can improve moods, sleep, lower blood pressure and can even help fight diseases, making it another reason to head off while you can this winter. The prospect of switching things up and having a break over winter is the perfect excuse to try something new. Due to differing climates and availability, your winter golf trip could take you to countries you would have never considered when looking for the summer months. Lastly, getting away during the winter gives you ample time to get practising ready for sunnier days. Quiet resorts and more availability will give you lots of opportunities to improve your game while enjoying a warm break. Check our more winter sun destinations here.